The Gophers had a good weekend on the road, beating Minnesota-Duluth 4-0 and 6-3. There seemed to be more players involved in the offense, and their depth up front was showcased for the first time this season. Minnesota’s top line was a little quiet production-wise, but Sarah Davis and Dani Cameranesi each had three goals on the weekend, which is a good sign for the team. They’re going to need plenty of secondary scoring to separate themselves from the pack and remain the nation’s number one team. Another positive for the Gophers: goaltender Amanda Leveille. The sophomore has proven these last couple of weeks that she can be counted on in net. Boston College was able to bounce back from their midweek loss to New Hampshire and earn wins over Yale, 4-3, and Dartmouth, 7-2. Their defense is still a bit suspect. They did a much better job of pressuring the Bulldogs than they did UNH, but they definitely let Yale hang around for way too long. Despite being down early to weaker teams in both games, the Eagles were able to regroup and maintain control, which they didn’t do against the Wildcats, and did especially well in the win over Dartmouth as they had a six-goal second period. Clarkson struggled for the first time this year as Mercyhurst held them without a win in two games. On Friday afternoon, the Golden Knights fell to the Lakers, 2-0, and on Saturday, the teams skated to a 1-1 tie. The loss was definitely a difficult game for them, but I think they responded fine even though they couldn’t get the win the next day. Clarkson’s offense slowed, so they’ll need to work on that, but I thought their defense played pretty well against a strong top-six. Goaltender Erica Howe also had an answer for nearly everything that came her way. There were both positives and negatives for North Dakota as they split their series with Ohio State with a 5-2 win on Friday and a 2-1 loss on Saturday. Despite winning by three goals, that first game was much, much closer than that. It was only a one-goal game until about seven minutes left in the third, and up to that point UND had trouble handling the Buckeyes’ defense on the breakout and in the offensize zone. North Dakota played much better in the second and third periods on Saturday, but they were playing from behind the entire game, which proved to be a disadvantage against this Ohio State team. Wisconsin bounced back from being swept by Minnesota with a sweep of their own, winning 4-1 and 6-0 over St. Cloud State. They put up 104 shots on the weekend while yielding a total of 34; all in all, it was a dominating performance from the Badgers. Their top players looked to be in sync once again, and freshmen Sarah Nurse, Sydney McKibbon, and Melissa Channell continued to make an impact. Though it was a good weekend for UW, they’re going to need to find a way to get their offense to translate against tougher opponents. 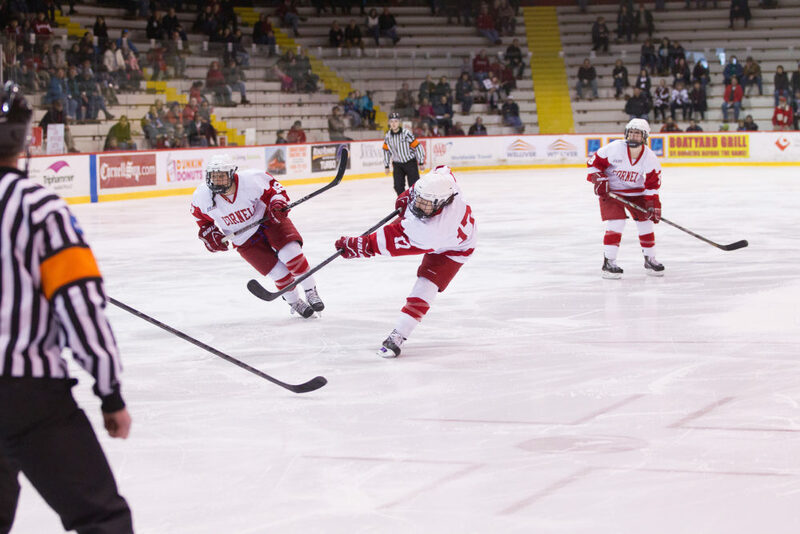 Cornell got off to a great to start to the season as they defeated Northeastern 6-2 and 3-0. Jill Saulnier was a little quiet, scoring a goal and an assist, but she’ll eventually pick up the pace. What’s more important for the Big Red is the production they got out of Emily Fulton and Taylor Woods, two players who will have to pick up some of the slack offensively. Defenseman Hayleigh Cudmore had a four-point weekend, which is also great news for the team. She’ll have to play well in all three zones this year as a leader on the back-end. With their talent up front, I thought Mercyhurst had a fighting chances against Clarkson, but I did not expect them to win the way that they did. The Lakers needed to make a statement defensively and did, only giving up 19 shots on goal in that 2-0 win and, obviously, shutting out the Golden Knights. Though Clarkson’s depth eventually started to show towards the end of the second game, Mercyhurst did a good job of matching them for most of the weekend. To only give up one goal in two games to that offense is a pretty big accomplishment, and it should give the Lakers a jolt in confidence on defense and in goal. Despite defeating Robert Morris 5-2 on Friday, it was not the best weekend for Boston University as they followed it up with a 3-0 loss, also to the Colonials. The Terriers were outshot in both games, and their offense has been shaky at best so far this year. Though Sarah Lefort, Kayla Tutino, and Louise Warren each had two points in the win, we haven’t seen much consistency from those three, and that’s a big problem for Boston University. If they can’t find ways to improve, better teams than Robert Morris are going to come away with much more than series splits against them. It’s not too late for things to change, but right now the Terriers don’t look like an NCAA Tournament team to me. After beating North Dakota on the road, Ohio State deserves some credit for the way they’ve been playing this whole season so far. They sat back in the 2-1 victory, which they can’t make a habit of against top teams, but the Buckeyes were really pressing UND in that first game. Twins Sara and Kari Schmitt have been fantastic on the blue line, doing everything you could ask of defensemen in all aspects of the game. They’ve been huge difference-makers so far and have really helped Ohio State with puck possession and defensive strength. The Buckeyes’ defensive corps has been very solid so far, making them a dangerous team. As part of World Girls’ Ice Hockey Weekend, Canadians celebrated with a “long game”, the longest female game ever. Here are photos of some Cornell players visiting preschoolers at the Cornell Child Care Center. A Hockey Canada feature on two-time Olympic gold medalist Gillian Apps, who’s trying to make the Olympic team once again. Gopher Sports profiled senior Bethany Brausen, who plays forward and is captaining the team for a second-straight year. Oh and by the way, Minnesota’s NCAA-record win streak is now at 55 games. Here is a really, really nice video from someone who attended a clinic in Burlington, Vt., with the U.S. national team. A look at Canadian national team captain Hayley Wickenheiser and her efforts to make a positive impact in the autism community by training autistic young adults. U.S. forward Lyndsey Fry is keeping followers updated on her and the team’s progress this year on her own personal blog. The latest update from Fry is here. Kelley Steadman, who won a gold medal with Team USA at this year’s IIHF World Championships in Ottawa, is playing in Russia this season and has a blog post up on the experience so far. USAHockey.com has two good features; one on California native Annie Pankowski, who’s trying to make the Olympic team out of high school, and the other on Minnesota defenseman Lee Stecklein, another young player who’s trying to make the cut. The Crimson has a really nice read on Harvard coach Katey Stone, who will be coaching the U.S. national team, and the program’s five players who are vying for spots on the Olympic roster. 1. Kelly Babstock, Senior, Forward, Quinnipiac: She scored a hat trick and five points on the weekend as the Bobcats continue to make some noise as a possible contender. 2. 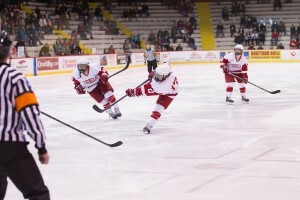 Blayre Turnbull, Junior, Forward, Wisconsin: She posted two goals and three assists in the Badgers’ series against St. Cloud State. I think Turnbull’s going to prove to be a very important player for Wisconsin this year. 3. Sara Schmitt, Junior, Defense, Ohio State: She factored into three of Ohio State’s four goals this weekend with a goal and two assists to help the Buckeyes earn a big split with North Dakota. A great pass from Meghan Dufault to find Michelle Karvinen streaking to the net in order to open up a two-goal lead for North Dakota in a very tight game. 2:26 mark of the video below.